Pizza. Everyone loves pizza. There is something magical about it. Even bad pizza is still pretty good. Well, we found one of the pizza places that goes above just “good” pizza, The Parlor. One of the unique things about the pizza at The Parlor is that it is interesting but uses for traditional Italian flavors. Only one pizza on the entire menu does not have at least one Italian influence (the Spicy Barbecue Chicken). 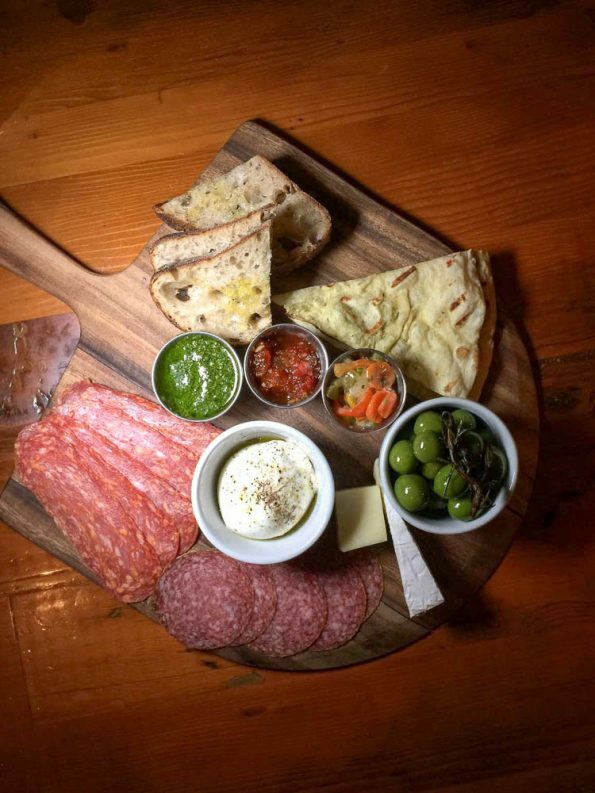 Chef’s Board (we selected: Calabrese Salumi, Molinari Sopressata, Red Barn Heritage Cheddar, D’afinois Brie, Gioia Burrata, and the house-cured olives)- The fantastic thing about the Chef’s Board at The Parlor is the ability to customize it to your preferences. The only rule is that you must order at least 2 items. This allows you to try a variety of things that you may not have tried yet. 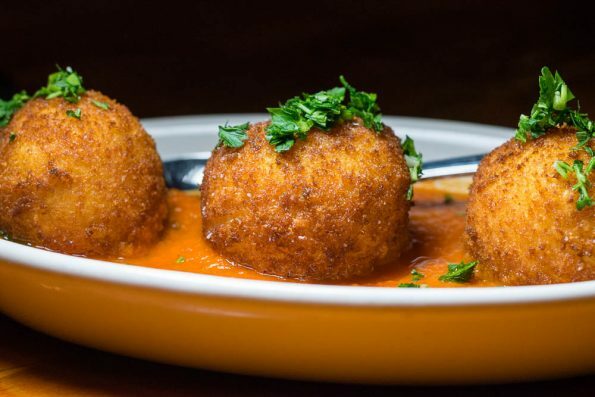 Arancini (crispy saffron risotto, provolone, Pomodoro)- The Arancini at The Parlor are the perfect version of this popular dish. The saffron risotto has just enough saffron and maintains its risotto-like consistency, all while the outside is crispy and flavorful. 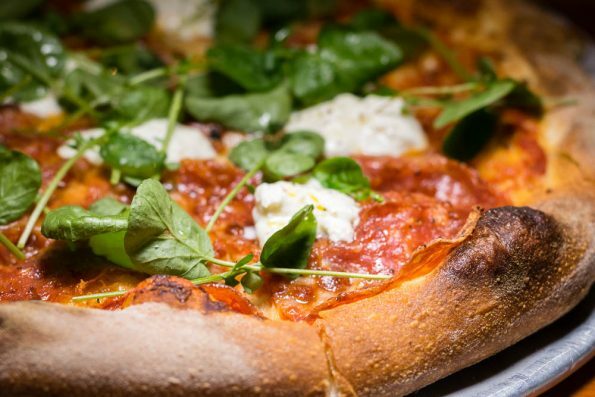 Calabrian (calabrese salumi, burrata, watercress)- The Calabrian pizza is simplicity at it’s finest. While it only had 3 toppings, the flavors were dynamite. The salumi was spicy and delicious. The rich burrata was creamy and helped neutralize the spiciness. Meanwhile, the watercress added a different level of texture and pepperiness. 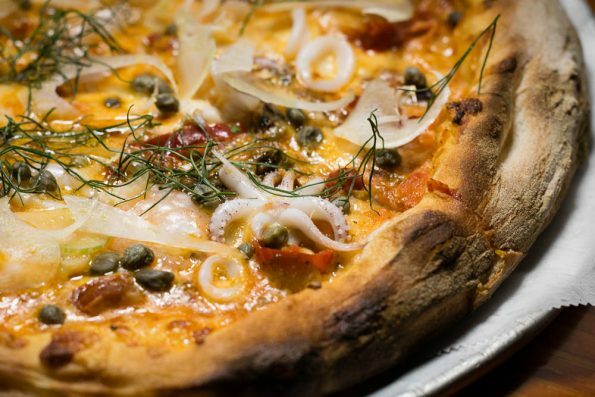 Puttanesca (calamari, shrimp, capers, spicy tomato sauce, olives, fennel, Calabrian chile)- Calamari on a pizza?! You read that correctly. This pizza was spicy and tangy all at once! This pizza definitely had some heat to it and would not disappoint the heat seeker. If you are a seafood lover, this one is for you also, the shrimp and calamari were cooked just right and weren’t too tough or chewy. We definitely plan on returning to The Parlor to try out more of their wonderful menu. So many pizzas, plates of pasta, and sandwiches to explore. The option are vast and likely just as delicious! Have you visited The Parlor? What was your favorite menu item? We want to hear all about it! Leave a comment below or use the hashtag #GeekEats! *The Geeks were given comped items to facilitate this write-up; Information about the menu items was provided to us, opinions are wholly our own. View our Disclosure Policy for more info.